My dad bought his first new car in 30 years recently and he's a little obsessed. In fact, I have it on good authority that he took the car's manual with him on vacation so that he could really get to know all that his brand new baby has to offer. After decades of driving bona fide clunkers, my father might finally be turning into…a car enthusiast. While I'm thrilled that he has a new hobby, I also know that car lovers can be tricky to buy for. They can be very picky about what goes in or on their vehicle and if you're not really into cars yourself, it might be tough to know where to start! So here are a few ideas for what to get the car enthusiast on your list this holiday season. Car art: If they already have a car they treat like a member of the family, consider having it professionally photographed and framed so that they don't have to be in the garage to admire the glory. Or if you know they have an aspirational vehicle, get them a framed print of their favourite car, so that they remember to dream (and save up). Car experiences: Sometimes experiences can be the best kind of gift, especially when your car lover has all the car "stuff" they need. Check out local racetracks for programs like the Bridgestone Racing Academy that offer lessons to drivers who feel the need for speed or who want to learn some of the cool stunts they've seen in the movies. If you're worried that they'll end up quitting their day job and start training for for NASCAR, consider getting them tickets to the local auto show - or better yet, an auto show that requires a road trip! Car fashion: Driving in heavy shoes makes it difficult to really get a feel for the road - if your driver is keen to drive like the pros, consider buying them racing boots (or other racing apparel, like gloves). Car games: The winter is a great time for your driving enthusiast to spend more time in virtual cars. There are several awesome racing games out for the holidays this year. Gran Turismo 6 for PS3, Forza Motorsport 5 for XBox One, and Need for Speed Rivals are just a few of the heart-pounding video racing games you can treat your car lover to. If you don't have a gaming system, here's an interesting alternative - this year there's a new "real-world video game" called Anki DRIVE that looks really cool. The game involves two toy cars, one controlled by you and one controlled by artificial intelligence. As your cars battle each other, each gains experience and gets better at racing, so the competition become increasingly intense. Hours of indoor fun! Car washes: Keeping their baby sparkling is always high on the list for any car enthusiast. Treat them to 90 days of clean with the Car Wash Season Pass! 90 days of Petro-Canada's top wash package is a great way to say "You care about your car - and I care about you". Car tech gadgets: For the car enthusiast who really wants to keep on top of the inner workings of their vehicle, check out a diagnostic scan tool like BlueDriver. The tool connects to your car's data port and lets you monitor how your vehicle is operating and troubleshoot problems using your smartphone or tablet. Great for drivers who really want to know what's going on under the hood with detailed reports and data. Another really nifty (and Canadian!) car gadget is Mojio. Mojio also connects to your data port and can be used via your smart phone for several different things, from providing reports on the well-being of your car to helping you locate your car if it gets towed or stolen. Mojio can be programmed to notify you if your teenage driver is going over the speed limit or you can set it up to hold calls or texts until your car is in park - great for avoiding distracted driving! Car cameras: If your car fan is participating in track days or motorsports, chances are they would love to be able to replay that winning lap over and over - or learn from their mistakes. A go-anywhere camera like a GoPro would be a great way for them to record and share their auto cross or track day POV. Car stocking stuffers: Keychains with their favourite car manufacturer's logo, a tree ornament of their favourite ride, or…nailpolish! In honour of the Ford Mustang's 50th anniversary, Ford announced that they'd partnered with OPI to create a set of Mustang-inspired nail lacquers. Perfect for the Mustang enthusiast who has everything but a nice manicure! Over to you, car lovers! 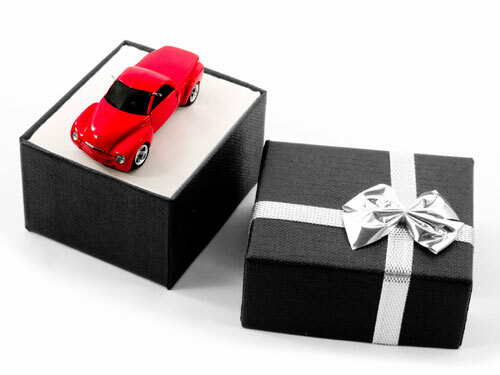 What's the #1 car item on your holiday wish list? Let us know in the comments! Thanks to you I have my Christmas shopping done. There were so many cool ideas in this blog! My boyfriend is getting Anki Drive and racing boots to go with his brand new Mini Cooper S.